The average Delhiite, already tottering under spiralling prices of essential commodities, will now have to pay more for his fuel as well. The prices of petrol and diesel have been hiked in the city following the new tax structure, effective from midnight today. Recognising the critical role of hydrogen as the potential green fuel of the future, the Ministry of New and Renewable Energy is setting up a National Hydrogen Energy and Fuel Cell Centre at Gwalpahari near Gurgaon for integrated and coordinated R&D on hydrogen. Delhi government has decided to implement recommendations of the National Knowledge Commission and set up a special purpose vehicle (SPV) for faster implementation of e-governance projects and to create a research and education network by inter-connecting all universities, libraries, hospitals and research centres. Two years after blasts rocked two packed cinema halls in the National Capital Territory of Delhi, the police have traced the main conspirators, alleged to be members of the pro-Khalistan outfit, Babbar Khalsa International, in Germany. In a first-ever initiative for any disease in India, guidelines were compiled for general practitioners and healthcare institutes to initiate a method for a suspected case of Coronary Artery Disease (CAD) and standardise the mode of treatment for better disease management. With the arrest of Naseem, Yunus, Sakir and Sahil, the East district police today claimed to have busted a gang of desperate robbers when the gang was conspiring to loot a CNG petrol pump in I P Extension area. The Delhi Government is planning to prepare a comprehensive database of senior citizens in the National Capital Territory with inputs from various organizations/agencies to initiate process of issuing identity cards to them. State Vigilance Bureau (SVB) caught a team of four persons, three revenue department staff and one other person for allegedly taking bribe to sanction the execution of the land registry. However, tehsildar Rajender Verma ran away from the registrar office, finding that his office had been raided by the SVB officials. The National Commission for Women (NCW) is sending its member, Malini Bhattacharya, to Sonepat tomorrow to assure itself of the well-being of three minor girls from West Bengal who allegedly suffered inhuman treatment at the hands of their Faridabad-based employers. A local court today rejected an application against the CBI and the Noida police in connection with the alleged preparation of a fake case diary in the murder of Payal, one of the victims in the Nithari killings, saying that the matter was already pending in a CBI court. Three drug peddlers were arrested and one kilogram cocaine worth Rs 3 crore on the international market was seized from them, police said today. Manipuri student Thaieni Hachani (21) was today found dead in mysterious circumstances in the bathroom of her rented flat in Kotla Mubarakpur. 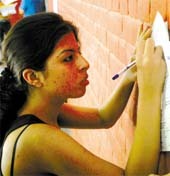 She was doing BA through correspondence from Delhi University. No suicide note has been recovered from the spot but some fellow students said she was depressed after getting very poor marks in English in the recently concluded semester exams. Residents of the posh Sun City colony here find themselves at the receiving end of alleged machinations and rule bending by the builder and management on the one hand and inaction on the part of the government to bring them to book on the other hand. The rise in the prices is the result of the Delhi Government "withdrawing concessions" on the fuels, given in June last. With this, while prices of petrol in the Capital rose by 67 paise, diesel prices were up by 23 paise because of the new tax structure on petroleum products, a senior government official said. Now, Delhiites will have to shell out Rs 43.52 for a litre of petrol as compared to Rs 42.85 earlier and for an equivalent amount of diesel they will be paying Rs 30.48 instead of the earlier Rs 30.25. The hike in the fuel prices comes close on the heels of the hike in the fare structure of public transport. The Delhi Government had recently announced a sizeable hike in the fare structure of buses, taxis and three-wheeler scooter rickshaws operating in the Capital. The R&D will be linked with industrial participation to reduce costs and develop technologies and business models for niche applications that can be commercially marketed. carried out in the country, but it is all spread over different laboratories, including those at IITs and the CSIR. Which is why a consolidated effort through the public private partnership (PPP) with industry participation is expected to put the National Hydrogen Energy Programme truly in the mission mode. At the end of the two-day hydrogen conclave here, the group of participating scientists, officials and leading industrialists have also prepared a list of recommendations, which aims to work for transition towards hydrogen economy through PPP. Hydrogen as a potential green fuel for future is expected to lead to the ultimate carbon-free energy demand and is seen as an alternative to fossil fuel on which national economy can be built. Climate change due to rising levels of carbon dioxide in the atmosphere is one of the most serious environmental concerns. As a pilot project, the ministry is also in the process of setting up a CNG-Hydrogen fuel station at Lodhi Road in Delhi. The project, being undertaken by the Indian Oil Corporation along with five auto companies, Tata Motors, Ashok Leyland, Mahendra and Mahendra, Eicher and Bajaj, is expected to be operational by 2009. Experts say in the beginning 10:90 per cent hydrogen: CNG mix will be made available that will work in existing infrastructure. Gradually hydrogen will be increased in the mix in later stages. "While working out economics of hydrogen energy, the positive environmental benefits should be taken into account and the focus of the R&D in this sector should be on the production of hydrogen through renewable methods and for cost reduction," minister of state for new and renewable energy Vilas Muttemwar says. Hydrogen is presently produced mostly from natural gas, coal and oil and electrolysis of water. The present cost of hydrogen delivered to the end-user is about Rs 240 per kg. However, the cost needs to be reduced at least three to four times to make hydrogen a viable option like petrol, CNG or diesel. Delhi government has decided to implement recommendations of the National Knowledge Commission and set up a special purpose vehicle (SPV) for faster implementation of e-governance projects and to create a research and education network by inter-connecting all universities, libraries, hospitals and research centres. This was decided at a meeting presided over by Delhi Chief Minister Sheila Dikshit, which was attended by Education Minister Arvinder Singh, secretaries of departments of education, IT, and Advisor, National Knowledge Commission S.Regunathan, who made a presentation on the recommendations. Senior police officers here claimed they had zeroed in on the movements of the suspects after tracking their telephone calls, a development that can bolster the probe into the May 22, 2005, blasts at Liberty and Satyam cinema halls in which one person was killed and several others were injured. The police claimed it had also moved an application before Chief Metropolitan Magistrate Seema Maini here for issuance of letters rogatory seeking information about the suspects from the German authorities, which was granted by the court. The letters rogatory (letter of request) seek information about Satnaam Singh, son-in-law of Babbar Khalsa chief Wadhwa Singh, his wife Sukhwinder kaur and another woman identified as Kanwaljit Kaur. The letter of request would be routed to Germany through the ministry of external affairs. In a first-ever initiative for any disease in India, guidelines were compiled for general practitioners and healthcare institutes to initiate a method for a suspected case of Coronary Artery Disease (CAD) and standardise the mode of treatment for better disease management. An expert committee chaired by Dr Naresh Trehan, an expert in the field of cardiology, presented the first consensus report on cardiac guidelines. These guidelines are a culmination of the research work and deliberations recorded by the expert committee, and were presented at the Annual Scientific Session of the Cardiac Society of India, 2007. The document has been compiled into a booklet, and is being distributed to the Cardiology Society of India members across the country. The committee was supported by MSD Pharmaceuticals Private Limited through an unrestricted educational grant for the purpose of the development of this document. Two iron rods, two button-actuated knives and one stolen Qualis car have been recovered from them. The police team got information that some dacoits gathered near Saint Peter Convent School. A trap was then laid around the area. When the police team challenged them, they started running but were apprehended after a brief chase. However, one of the accomplices managed to escape under the cover of darkness. In another incident, the Central district police claimed to have arrested one Raghuvansh from Yamuna Bazar area and Raju Shukla from Karawal Nagar area. They were wanted for stealing cash in a shop in Bhagirath Place area. They stole Rs 10 lakh and a few cheques from the shop. Hundreds of residents of Atali village laid siege to the Ballabgarh-Mohna road this morning in protest against disruption of power and water supply to the village. While the traffic remained disrupted for more than four hours, several vehicles of the administration, including that of the SDM, Ballabgarh, were damaged after the crowd turned violent and started pelting stones. The blockade was lifted later after intervention by the village elders. The villagers had been demanding immediate replacement of a power transformer that had been lying damaged for long and action against the officials of the department concerned. The traffic on the road, about 12 km from here, came to a halt at about 8.30 am when the locals, mostly women and youth, started assembling at the spot and squatted there. At least 500 persons were gathered when the SDM and the DSP reached there. The protesters did not budge even after they were assured their grievances would be redressed by this evening. They continued shouting slogans. They claimed the transformer in the village had burnt about three months ago. It was neither repaired nor replaced despite several complaints. As a result of electricity not being there, the water supply in the village was also disrupted. The villagers decided to block the traffic on the road to get the attention of the authorities concerned, claimed a villager. A mob started pelting stones on vehicles of government officials when there was an altercation between the villagers and the police after a youth was reportedly slapped by a policeman. As many as eight vehicles, including that of the SDM and the DSP, were damaged. SDM H.C. Jain said the administration kept its calm despite the violence by the crowd as a majority of those protesting were teenagers and women. The police did not want to use force against them. He said the situation was brought under control and the blockade was lifted with the help of village elders. Complaints of power department officials not attending to faults and damage to transformers in the rural areas in a prompt manner are common. Some of these are even reported to the district grievances committee, which holds a meeting every month that is chaired by the Health Minister. The Delhi Government is planning to prepare a comprehensive database of senior citizens in the National Capital Territory with inputs from various organizations/agencies to initiate process of issuing identity cards to them. This was announced by Delhi Chief Minister Sheila Dikshit while presiding over the 3rd Meeting of the State Council for Senior Citizens which was attended by health minister Yoganand Shastri, education minister Arvinder Singh, secretaries of Department of Transport, Health, Social Welfare, director (Social Welfare), addl. commissioner (Police) and non-official members of the council. It was decided to use the inputs from the election office, census office, Delhi Police, Social Welfare Department, elected representatives, NGOs, RWAs who are maintaining details of senior citizens so that a comprehensive database could be prepared which may be utilized as base material to initiate the process. These identity cards would also include details and sphere of facilities for the senior citizens. As far as issue of protection of life and property of senior citizens is concerned, members in the meeting expressed satisfaction over the actions taken by the Delhi Police. Dikshit exhorted members to submit their suggestions as per notified policy for senior citizens. It may be recalled that the Delhi Government notified a policy for the senior citizens on October 5, 2006. This policy recognizes senior citizens in Delhi as individuals worthy of respect, care and protection. It lays emphasis on providing a supportive environment to senior citizens to live with purpose, peace and dignity. The policy defines senior citizen as one who is 60 years old or above. According to the 2001 Census, the total population of senior citizens, both males and females living in urban and rural areas in Delhi was 7,19,560 against a total population of 1,37,82,976. During the last few decades, better healthcare facilities have led to a significant increase in the life expectancy of citizens in Delhi. Improved life expectancy combined with high growth rate of population has contributed to an increase in the number of senior citizens. It was decided in the meeting to chalk out a plan of action to transfer management of old age homes being run by the Department of Social Welfare to the NGOs. There are two old age homes, one at Kalkaji and another at Tilak Vihar. The Government has also decided to institute an award for the best-managed recreation centre for senior citizens. At present, 28 recreation centres in different parts of the city are operational for which Delhi Government is providing financial support. Superintendent of police, Gurgaon Range, SVB, Rajbir Deswal informed that Ved Prakesh, a resident of Sohna complained to the vigilance department that the registrar office at Hathin in Mewat district allegedly take bribe of one to two per cent for sanctioning the registries regularly. He stated in his complaint that he had paid Rs 60,000 to tehsidar Rajender Verma on May 17, 2007 for sanctioning one registry. Ved Prakesh mentioned that he was to get one registry sanctioned today for which tehsildar allegedly demanding one per cent of the total amount of the registry. Bhattacharya told TNS here she would visit the Haryana Government-supported Bal Gram in Sonepat to satisfy herself about the welfare of the three girls aged 8,10 and 12, respectively. The NCW had intervened in the case three months back after taking suo motu cognisance of a news report about their rescue by Shakti Vahini, a voluntary organsiation. The NCW member said a volunteer from Jobala, a West Bengal-based non government organisation will join her to Sonepat and use its network in the girls' home state to locate their addresses and facilitate their safe return home. She said that the Commission has sought an action taken report from the Faridabad Police and hopes to meet the Investigating Officer at the Bal Gram to see what penal action has been taken against the accused industrialist. It will also urge the Faridabad Police to put pressure on the industrialist to disclose the name of the Delhi-based placement agency. The girls are reported to have been hired by the agency for domestic work. The member said that the NCW demands exemplary punishment in cases of child sexual abuse and sub human treatment of children. "It is clear that these girls belonging to poor families have been grievously injured and abused very seriously. The children alleged that the industrialist's wife was also torturing them." Bhattacharya said the commission hoped to identify in this case the trafficking network from West Bengal to Delhi. She said the only clue they had got so far was from the 12-year-old girl who mentioned her home in Egra in East Medinipur district in West Bengal. Bhattacharya, who met the girls three months back in Bal Gram where they had been moved on the instructions of the magistrate, recalled they were in a sorry state. "The eldest girl alleged sexual abuse by the employer. The three girls alleged they were often beaten up with rods and leather belts so much so that one of them even lost a tooth. They had injury marks on their faces and legs. The youngest among them was so malnourished she had to be given blood transfusion on being moved to Bal Gram", she said. The NCW menber said the commission received quite a few number of cases of child abuse. Chief Judicial Magistrate (CJM) Himanshu Bhatnagar rejected the application moved by advocate Khalid Khan on the ground that the Payal murder trial was under way in the court of CBI Additional District Judge (ADJ) Rama Jain. The CBI court was the only competent court to take the lawful course against the CBI and the Noida police, the CJM said and advised the advocate to move the CBI court in this regard. Payal is one of the victims in the Nithari killings case in which businessman Moninder Singh Pandher and his servant Surinder are the accused. Three drug peddlers were arrested and one kilogram cocaine worth Rs 3 crore on the international market was seized from them, police said today. Sartaj, Ram Baboo and Yusuf were arrested when they were sneaking into the national Capital from UP border today, senior superintendent of police Ghaziabad Deepak Ratan said. Police is further investigating the case and the hunt is on to locate the buyer of the contraband in Delhi, he said. Further investigations are on. In another incident, a couple, Subhash and Seema, allegedly committed suicide in Bawana in the morning. A suicide note was recovered wherein they jointly declared they was no need for conducting autopsy of their bodies, said a police officer. The residents allege civic amenities promised to them by the builder-management of the colony are missing. The upshot of it all is that they are now ruing their decision to opt for residing in the colony after they were lulled by the sleek promotion brochuresand sales talk by the management. A good number of residents, who have organised themselves under the banner of the Sun City Residents Welfare Association, said one reason for their disposing of their property to opt for settling in the colony was better law and order scene in Gurgaon compared to the other satellite township of Noida in the National Capital Region. The management, however, has been urging the residents to be patient while putting the blame on the government for erratic supply of power and water. A functionary of the association alleged for the past more than a year the residents had been facing a spate of thefts and burglaries in the colony spread on about 168 acres in the new city area of Gurgaon. The culprits break open the door and steal only jewellery, cash and heavily priced articles. In the past just over one year, there have been 18 cases of burglaries, including those at the residence of an income tax commissioner and a retired secretary of the Government of India. According to the residents, the thefts occurred despite the security agencies hired by the builder-management. They alleged the management asked security personnel to watch over its other sites and property, allowing laxity in security at Sun City. They said they had already paid the management money in the name of security management. The other grouse of the residents is that the builder-management violated the law and set up houses according to floor system and sold off 621 floors to the public. They were provided licence by the Town and Country Planning Department of the Haryana Government for "group plotting". This meant that only one plot could be sold to an individual buyer. But the management constructed floors and illegally sold them to the buyers with the result that even after four years the sale and purchase could not be registered in a court of law. Also, the residents pointed out in keeping with the prevalent laws the colony had to have four per cent of the area for shops for the benefit of inmates of the colony. Rather, only meagre space (on about .86 acre) had been used for setting up a shopping arcade. Orchid Plaza had come up in the name of market premises.